Welcome to patch 6.1, the fresh one with that new season smell. It's been a long winter for us here at Riot Games, but we're back and ready to get to our outlier-balancing ways. Looking at you, Frost Queen's Claim. Speaking of balancing outliers, that's primarily what this patch for - with the professional leagues - and some of our bigger projects - ramping up, the last month of 5.24 play has provided us with a ton of data to analyse. For now, however, it's clear a few things are out of line (or under the line, as the case may be). We've got buffs to the underachievers like Kha'Zix and Fiddlesticks, and power reductions to our bigger bullies (like Trundle and Miss Fortune), as well as an assortment of ups and downs in-between. But it's the first patch of the new year, and we'd be lying if we said our normal serving of balance updates were all we had in store. The new ranked season is beginning, giving tryhard veterans and bushy-tailed beginners alike the opportunity to start afresh. As our 2016 gift to you, we've also got a New Champion Select (title capitals here), designed to provide a revamped and re-designed draft experience - no matter what mode you play. Once it ships, we'll be retiring Team Builder; so long, and thanks for all the victories! And that's it for us! It's been a while, but we hope you join us in ushering in the new year and making this season the best one yet. New rewards, new challenges, and new champions await - and we'll be right there with you for the ride. New champ select is coming to Ranked Draft. The new champ select experience will be enabled for Ranked Draft later this patch! We're starting with tests in NA and TR on January 14. If everything goes well, we'll continue to roll out new champ select in other territories over the following days. A few key details of the system are listed below; make sure to head back to the 2016 Season Update site for an in-depth overview. When new champ select launches, devs will be on the boards to gather feedback and track known issues. Let us know what you think! LOCK IT IN Bans and picks must be locked in. Hovering doesn't count! Failing to lock in a ban or pick will result in a dodge with a time penalty. Lastly, the launch of new champ select marks Team Builder's retirement. New champ select is a better answer to many of the problems we were trying to solve with Team Builder, so we're opting to replace Team Builder rather than having both queues exist together. The 2016 ranked season commences this patch! Keep an eye out for more information! Pretty obvious that this wasn't working as intended. For all of you who've been double killed by Brand's ultimate while standing inside a minion wave, #bigsorry. Less weirdness around using Headshot. Caitlyn seems to have landed in a good spot post-update, but there's still some awkwardness to clean up around the usability of her new-and-improved Headshot. Dark Wind mana cost down. Let's be clear, this is a small buff. We're fairly certain that Runic Echoes will benefit Fiddlesticks, but we also wanted to give this old-school kit (with those massive mana costs) a small bump in the right direction. This will probably help out Middlesticks or Supportlesticks (we stretched for that one) more than Junglesticks, but at least this offers an alternative leveling path for those who want to bounce around. Passive ratio down, duration increased. As history would imply, Gangplank is a hard man to keep down. Despite chipping away at his explosive area-of-effect damage, GP remains above the curve in the laning phase thanks to Trial by Fire's incredible damage output (especially when reset with Powder Kegs). With Gangplank's hyper-scaling potential, it didn't make much sense for him to also shove opponents out of lane like he owned the place. So we're adjusting. E's less mana-efficient when rending single targets. Even with the preseason itemisation changes (which were more beneficial to casters and crit-wielding marksmen), Kalista has been working her way up the list of must-answer threats. The change we're doing is a little specific, so let's get into it: we wanted to reduce power without having a negative impact on Kalista's feel, skill gap, or general strategic identity. To go deeper: one of Kalista's staple lane harassment combos is to continuously Rend single minions + lane hits against her opponents for quick damage (and very low mana costs), so we're reducing that mana efficiency. We're still forming a more nuanced opinion of Kalista in this new season, and will keep an eye out. With the removal of Ranger's Trailblazer, Brutalizer, and the old Last Whisper, Kha'Zix lost a lot in the transition to 2016. Our previous attempts to restore some of his former glory were well intentioned, but weren't enough to bring the bug back. 6.1's all about helping Kha'Zix achieve successful isolation without needing to increase the isolation range itself. Highlighting and enabling Kha'Zix's ability to capitalise on the missteps of his prey fits perfectly with KZ's own motto: evolve, and overcome. E and mimic'd E's missile speed up. Flashy and tricky, successive nerfs to Leblanc have her feeling less-than-responsive recently. With immobile mages still on top, we're taking the opportunity return some snappiness to keep LeBlanc's foes on their toes. Passive ratio down. E damage down. The bottom line is this: Miss Fortune's doing too much damage. While most of it is warranted (especially when aided by allies to combo some amazing Bullet Times), Make It Rain's increased range and synergy with Thunderlord's Decree have turned it from an area control spell to just another way to bully her opponents. That said, MF's not far off from where we'd like her laning phase to sit, so we'll be watching her this patch to make sure she hasn't walked the plank entirely. Shield takes longer to decay. W is now castable on minions. R gives Mordekaiser's attack damage, and does more damage over time. Following up our changes in 5.23, these are similarly focused on cementing Mordekaiser's pattern as a slow but terrifying Juggernaut (capital J). Weakening ability power builds in favor of more hybrid ones is the name of the game, favoring sustained threat over time instead of '1-shot comboing your soul into pieces.' Reverting some of his shield decay and W's ally-target functionality, Mordekaiser should find himself able to pick fights while solo or duo to keep on shredding. Another patch, another Riven buff (I'll take words we never thought we'd type for 500, Meddler). Not much has changed since the last time we met - itemisation isn't great for champions like Riven, and while her health regen increase showed promise, it didn't exactly move her as much as we'd like. Handing back some early-game strength should let her work where she shines most - without contributing to her endgame combo potential. Q range and tick rate increased. Rumble's body is now smaller. Piloting a literal junkyard, you almost expect Rumble to feel clunky. Alas, you can have too much of a good thing, often leading Rumble to feel like he's better left for the scrap heap than in top lane. Adjusting Rumble's specs for manoeuvring in minions while upping the consistency of Flamespitter means he can focus on the complexities that really matter, like not entirely missing his Equalizer. Attack damage up. R range increased. Passive stealths while moving in brush. Another champion that's been struggling in 2016, Teemo's woes have not gone unnoticed. The prevalence of Farsight Totem has hurt his ability to play hide-and-seek with Camouflage, while losing out on the bonus attack damage from the old masteries means he's having a harder time in lane. Tuning these while adding a bit of range to Noxious Trap go a long way toward improving his strategic ability to scout - as well as feed into his natural prey of fighters and juggernauts. While the below changes might look like a buff and a nerf to Camouflage, the double stealth mechanic wasn't necessary (as you will now be entering stealth the moment you walk in instead of needing to stop), so you take about the same time to stealth but can also stealth while running. Now that's sneaky. Q no longer works on towers. Pillar's cost up. R's cooldown and cost increased. What a difference 50 attack range makes. Every year there's a champion that perfectly benefits from most of the season's changes, and in 2016 (with better itemisation and a higher importance on skirmishing), it's Trundle. We're taxing the troll's mana pool to curb some of that non-stop aggression. Quick call out on that Q nerf: with turrets being weaker this season we felt this was a good middle-ground instead of outright dulling those teeth. Q is more usable after charging. Just some usability to keep the Keeper of the Hammer keep on keepin' on. CORROSIVISION Fixed a bug where Noxian Corrosive Charge was granting too much vision for the duration. Too bright for his own good. ELECTROVISION Fixed a bug where Heimerdinger's grenade was granting too much vision for the duration. The only one that's worth calling out is the last one on the list - this was actually implemented in 5.22, and primarily helps melee vs ranged matchups with respect to basic attacks. Simply put, the 'call for help' used to be around yourself and not the enemy, meaning that when they'd harass you off the wave, your minions would often 'pretend' not to notice as they went about their business. Now minions are more courageous and will actively watch for enemy harassment. Runic Echoes is a cheaper Luden's Echo for junglers. While it has less ability power and base damage, it restores a large portion of your missing mana on hitting a Large Monster - in addition to dealing bonus damage! When we introduced the Runeglaive enchantment in Season 5 it, like the incredible Zoot Suit, was specifically tailored for its time. In development, we took a hard look at all of the existing AP junglers and tried to deliver a finely-tuned item that would enable them beyond "bundle of stats" (with Fiddlesticks as an accepted casualty. Sorry Fiddle.). At that point, our view of AP junglers was fairly narrow and our goal was definitely "solve for the present." This season, we can take a more future-facing look at Runeglaive (now Runic Echoes). The introduction of Hunter's Talisman means we can solidify spell-casting as a core part of an AP jungler's rotation, so it makes more sense that Runic Echoes is an extension of that. Echoes should be a flat upgrade (or sidegrade, at worst) for most champions, to the point where we'll probably need to keep a close eye on the balance of that movement speed bonus. One additional issue we wanted to solve was to allow for late game scaling on an AP jungle item - something Runeglaive lacked due to its lower ratio in comparison to Lich Bane. On the point of, "Why not both?" we'll go back to the discussion we had when we replaced Magus. Specifically, if the goal of Runic Echoes is to serve all AP junglers equivalently or better than Runeglaive, then Runeglaive either becomes another Ohmwrecker (sorry) or it's an "alternative" choice for a smaller subset of AP junglers that skews their balance on yet another axis. The question we asked was, "What do we gain by keeping Runeglaive?" and while the diversity option for a few champions was nice, we trade a lot of clarity in balance to keep two items that should functionally serve the same class. UNIQUE PASSIVE Echo - Gain charges upon moving or casting. At full charges, the next spell hit expends all charges to deal 80 (+0.10 ability power) magic damage to up to 4 targets. This effect deals 250% damage to Large Monsters. Hitting a Large Monster with this effect will restore 18% of your missing mana. No longer triggers spell effects. Smite's been through an interesting transformation. Once one of League's more 'vanilla' spells, it's turned into a multi-charge, multi-augmented ability that provides tons of utility. While Smite's slowly crept up in strength, it was the introduction of Runic Echoes interaction with Smite where we finally needed to draw the line. Having an instant high-damage nuke is probably not in anyone's best interests. Just some slight tuning to make these a bit more attractive/easy to upgrade compared to just buying the component of your enchantment (Caulfield's, Aether Wisp, etc). Continuing Rift Herald's welcome to the League by nudging his dream-crushing power down, bit by bit. It's a potent tool for pushing advantages, but so often the health cost for taking it is so high that teams still aren't sure when to go for it. Raptor's vision buff is more forgiving. 2016 saw a change in the vision range of different types of wards, but not the trigger range of Razor Sharp (or for those of y'all that don't read, the 'Raptor Vision Buff'). Functionally this meant you could ‘proc’ the ward-spotting buff without the ward even seeing you (leading to even more confusion when hunting down that pesky ward). No more! If it sees you, you should see it, and vice versa. Once the staple trinket, Warding Totem's found itself feeling pretty mediocre compared to the Farsight Alteration. As we seek to adjust the balance between the two, dropping the lategame cooldown significantly ensures teams can access more consistent vision with a Warding Totem in their inventory. By contrast, Farsight's dominance tends to warp the strategic game - putting more weight on its spot use as an in-fight or pre-fight reveal, but offering very little in the way of long-term vision to control objectives or jungle corridors. Farsight's effect is powerful enough that we're confident it'll still see use for what it does, but it shouldn't feel like your default option in 100% of games. Can drink elixirs while dead. If you're like us, you may have found it frustrating to respawn at a tense moment, delaying your battle charge by having to double-click an Elixir. Considering Elixirs are items too, we've now made it so you purchase them while dead to get to your battle faster. Important note: if you buy an elixir while dead, it'll begin ticking down instantly, but the amount of time you have left to respawn will be added to the duration - so your elixirs always last the correct amount. Don't freak out! Mana regen down, CDR up. If you're a support in 2016, mana regeneration's just about everywhere you look when it comes to full item builds. In the interest of providing supports with a different stat (while still keeping these items focused on spellcasting), we're trying out cooldown reduction to make them fit as smoothly as their Tier 3 brethren (Talisman of Ascension and Frost Queen's Claim, respectively). If you've been watching for the context here, turn your eyes above. Less mana regen. Slow now scales with distance. Ah, Frost Queen's Claim. Even if you've never bought it, you've seen it - and the army of ghosts slowing you from across the universe. While potent as a form of vision control and a playmaker for spellcasting supports, this raw stat efficiency combined with crowd control made it far more ubiquitous than is healthy (when you start to see champions like Tank Maokai buying this, you know something's up). Cutting FQC's efficiency and impairing its use as a close-range sticking/peeling tool requires more pre-meditation on the part of it's user to get the same level of crowd control. We'll continue assessing if we need to tone down that spooky. Bring me my cape of suns. Sunfire's often the odd-man out when compared to its cousins: Randuin's Omen and Dead Man's Plate. We're giving it a bump to feel like a real contender when shopping for physical protection. GUINSOO'S RANGE Ranged champions no longer activate Guinsoo's Rage on the same basic attack that grants them their eighth stack. Shifted movement speed from Spectral Waltz to base movement speed. Phantom Dancer's intended niche as an item that enables you to seek out and duel champions is betrayed by losing Zeal's movement speed upon upgrading it. We'd still like it to stay on the lower end when not hunting down dance partners, but giving back some strategic movement speed should keep it more than just a phantom. While trying to keep the relative balance between Zeal's upgrades, we decided Shiv was lagging behind as a waveclear option. No longer! Similar to Statikk Shiv, Hurricane's getting a power boost to keep Zeal's upgrades close enough that you can use their unique effects (waveclear, teamfighting, kiting, or dueling) as the selling point, not their stats. The last Zeal item to be touched, Rapid Firecannon is performing about as well as we'd expect. As we were doing our unification pass to balance the four, we saw that 8% is higher than 7%, and that simply won't do. Last Whisper's upgrades don't have enough of a payoff, even when you'd find their unique effects useful. Now investing gold into either the Giant Slayer or Executioner's upgrade will have a little more 'oomph'. Also more bonus armor penetration! You can read the context for this directly above, just a reminder. A mortal reminder. The Hydras are doing well once purchased, but often feel like they take forever to get completed. Along Tiamat's cost being shaved, a reduction in Ravenous Hydra should make them easier to complete. This is the same context, only more Titanic. Cost, attack damage, physical healing, damage reduction (and bleed damage taken) all increased. Death's Dance is a truly unique effect that provides an even more unique fantasy: someone marked for death, doing everything they can to keep going beyond their final moments. As awesome as that sounds, DD's stat efficiency doesn't exactly set it up to support the champions and builds you'd want it to. Sizing it up to better deliver on expectations. MORE DANCE PARTNERS Fixed a bug where the heal wouldn't occur with some on-hit effects, such as Aatrox's W - Blood Price, Blade of the Ruined King, or the Hydras. Ferocity and Stormraider's buffed, Precision nerfed. If you've played even a handful of games on patch 5.24, you probably learned the same thing we did - 8-10 Thunderlord's Decree per game is probably too many. Yet, no Thunderlord's changes. What gives? While Thunderlord's Decree is the go-to mastery when you're looking to dominate your lane, we're leaving it as-is for a few reasons. First, we're looking to it as a 'goalpost' from which we balance the other keystones around. It's something you can easily play around, has a good amount of impact, and synergises well with certain champion kits. Additionally, we're avoiding playing 'whack-a-mole' with the Keystones (ie: just nerfing whichever is best at any given moment). By recognising TD's strength and matching others to it, we build a better ecosystem for Keystones where you're free to adapt your builds, rather than just playing champions that abuse the best mastery. So how are we tipping the scales? Injecting some strength back into Ferocity's Keystones while reverting buffs to Precision should help balance things out, no matter how you seek to deal your damage. Toss in a pretty spicy update to Stormraider's Surge and you have a wealth of options at your disposal. It's still possible that Thunderlord's is over-tuned after all this, but bringing the others more in line with the leader should help us gauge how big the discrepancy is, rather than just cutting down the top over and over again. Less healing early, but more later. Attack speed up. Damage on-hit increased, stacks decreased. Ability power and attack damage ratios increased. Speed and window to activate increased. Now gives slow resistance. Health restore changed to percent maximum health. Damage reduction increased, but no longer doubles. Now reduces the duration of disarms. For those not in the loop, 'disarms' are abilities that remove a player's ability to basic attack. While most cc does this (because you can't move period), Lulu's Whimsy and Amumu's Curse of the Sad Mummy are unique in that they either let you still move (in Lulu's case), or they let you cast spells (in Amumu's). So we're calling them disarms. And now they're affected by Tenacity. Back in 5.22, we did a large sweep and cleanup to how the terrain of Summoner's Rift impacted vision along their edges. Now it's been done for Howling Abyss! A little late for the holidays, but we bet the poros appreciate it anyways. CLARITY Gaining vision inside brush on Howling Abyss better reflects the reality of what is inside that brush. SNOW-TRIMMING Fixed the visuals of the brush on Howling Abyss to better reflect the boundaries of said brush. 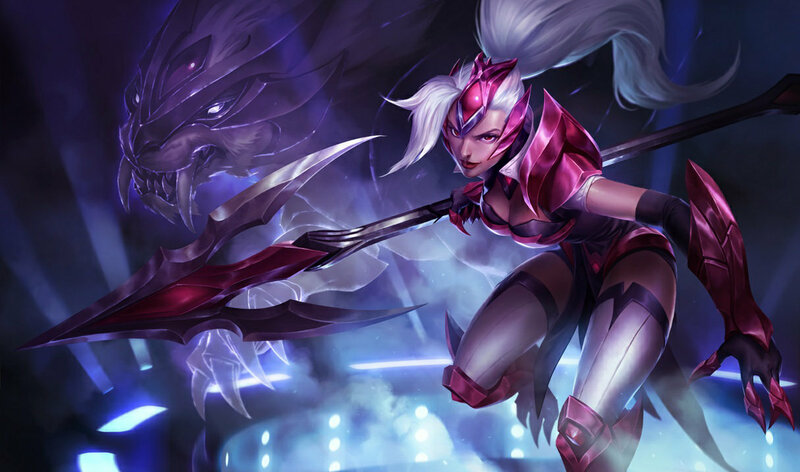 To commemorate the start of the 2016 season, Challenger Nidalee will be released later this patch!